Up to 60 percent of patients who receive a stem cell transplant using cells from another donor will develop post-transplant diabetes mellitus, which can increase the rate of complications and death after the procedure. 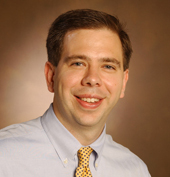 Brian Engelhardt, M.D., MSCI, assistant professor of Medicine, has received a Mentored Career Development Award from the National Heart, Lung, and Blood Institute, a division of the National Institutes of Health, to explore the causes of post-transplant diabetes development. The grant will provide research funding of $373,500 over three years. Allogeneic hematopoietic stem cell transplantation (HCT) uses a portion of a healthy donor’s stem cells or bone marrow to treat patients with various forms of blood cancers or other blood disorders. However, patients are at risk for several complications after transplant, including the development of diabetes, a disease that affects the body’s use of blood sugar or glucose. “Post-transplant diabetes is a common complication following HCT that negatively affects survival,” Engelhardt said. Engelhardt’s research will focus on the relationship between increased inflammation, immune regulation and insulin sensitivity in cancer patients undergoing allogeneic hematopoietic stem cell transplantation. “We will investigate insulin sensitivity and examine the inflammatory environment before and after transplant as a potential contributor to post-transplant diabetes,” Engelhardt said. During the project, Engelhardt will be mentored by James Crowe Jr., M.D., Ann Scott Carell Professor and director of the Vanderbilt Vaccine Center, Alvin Powers, M.D., Joe C. Davis Professor of Biomedical Science, and Naji Abumrad, M.D., John L. Sawyers Professor of Surgical Sciences. “This research is well suited to Vanderbilt due to its history of inter-departmental collaboration and longstanding history of novel metabolic and cancer research,” Engelhardt said.